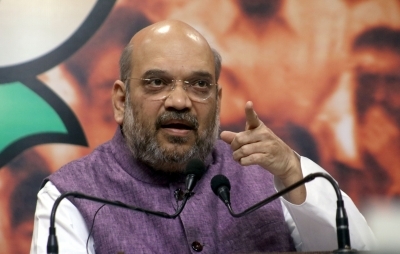 Hyderabad Sep 14 (IANS) BJP President Amit Shah will launch party s campaign for the ensuing elections to the Telangana Assembly on Saturday by addressing a public meeting at Mahabubnagar said a senior party leader. Amit Shah who is arriving on a day-long visit to Telangana on Saturday morning will also give directions to the Bharatiya Janata Party (BJP) s state leaders about poll strategy and election manifesto. According to BJP s Telangana unit President K. Laxman Shah will have meetings with various groups. He will also visit a temple in the old city of Hyderabad. The BJP chief will review the party s preparations for the coming elections at a meeting with top leaders. He will issue necessary guidelines to them to gear up for the poll battle. Shah will later proceed to Mahabubnagar to address the public meeting to formally kick off the party s election campaign. Laxman said Shah will visit Telangana again after 10 days to address a public meeting in Karimnagar. Chief Minister K. Chandrashekhar Rao on September 6 dissolved the state Assembly to pave way for early elections. The BJP had five members in the dissolved 119-member Assembly.